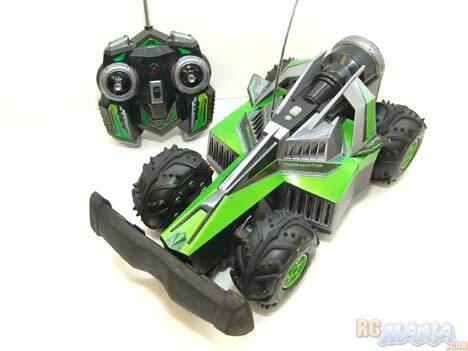 Jakks Pacific offers the XPV Super Terranator as an all-terrain ultimate powerhouse vehicle. 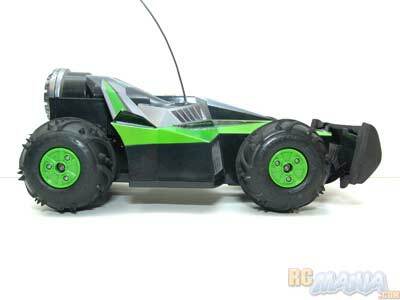 Compared to most RC vehicles its size, it has basically double of everything, with two motors, four-wheel drive, an insane 12V battery system, and a whopping 4+ lbs. of obstacle-crushing mass. It's definitely smaller than it looks in pictures, though, at 7 1/2" wide and just over 13" long including the very large front bumper. 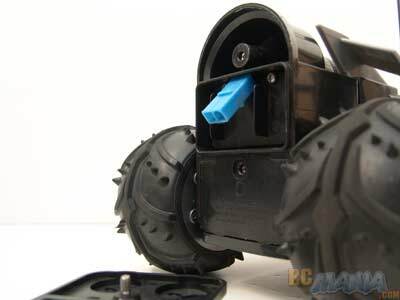 The XPV Super Terranator just needs a 9V battery for the controller to get running. It has a rechargable battery for the vehicle itself, and includes a charger in the package, but interestingly, the battery cannot be removed. Instead, you remove a watertight rear hatch toe xpose a battery charging jack, and you plug the charger directly into that. At first, I ignored the warning on the box of Super Terranator that says "USE OUTDOORS ONLY." Boy, was this a mistake. Barely tapping the throttle lever sends Terranator rocketing off with surprising speed. The acceleration is absolutely explosive! There's a reason they include a foam bumper cover -- it's to help lessen the damage to other things, not to the Terranator! Moving outside, I first tested the Terranator on regular pavement. The speed, as I said, is very impressive. I clocked it at nearly 17mph, which is over 200 scale mph. It takes it almost no time to get to this speed, too. The drivetrain is set up with one motor driving both wheels on the left, and the other driving both wheels on the right. To steer, the motors are run in opposite directions, causing the vehicle to spin rapidly like a tank can do. This is really surprising and cool when you're not moving, as to turn around, you just press the turn lever on the controller and spin instantly. When you're driving at speed, though, this unique steering system becomes a bit of a problem. Because there's no digital proportional control, any steering input makes it spin in that direction as fast as it can, which includes spinning the tires on one side of the vehicle backwards, even though the whole thing is moving forwards. This makes the Terranator just spin out. To keep it from spinning almost out of control, you have to be careful to just barely tap the steering in the direction you want to go, and even then, sometimes it's too much. It also helps to slow down a lot before you start your turn. If you're going too fast, the sudden turning can cause the whole vehicle to roll and flip over violently, damaging the antenna tube. On dirt, firm sand, and short grass, the Terranator shined. The aggressive-treaded, real rubber tires gripped well and the dual motors propelled the vehicle around with authority. The only shortcoming is the fairly low stance which is important for high-speed handling, but keeps the Terranator from going over some larger bumps. The XPV Super Terranator has its ups and its downs. Off-road it does very well. It's almost completely waterproof and thus can go through some mud or hard-packed snow without any danger to the electronics, which is a real plus for drivers who like to get their vehicles dirty. On the street, it is very fast in a straight line and can do donuts better & faster than anything in its class, but turning at speed is challenging and can lead to spinouts & damaging rollovers. In all, it's a tough, powerful vehicle, but can't really be driven to its extremes.